This living room is a very sophisticated ecletic mix of elements. The client wanted the space to have the panache of a European penthouse....and...so it is. The fabulous Coromandel Screen hung over the sofa is a beautifully done. It is an 18th Century ebony folding screen decorated by the application of semi-precious stones. Here the scene typifies Chinese life and the predominating stones are coral, jade, ivory, malachite, carnelian and others. Originating in Northern or Central China during the Kangxi period ( 1662-1722 ) of the Qing dynasty, it is from the Coromandel coast in India that these decorative pieces received their name. This particular screen is not an original, but is an Antique circa 1800. The end tables are English origin with leather tops and actually were meant to be library table. They are Antiques, circa late 1800's, are solid mahogany with drawers that are satin wood faced. I found the pair of lamps which were Chinese Famille-Rose vases circa mid1800's and I redesigned these fabulous pieces into the wonderfully impressive lamps that you see here. The pair is mounted on solid bronze bases with a custom silk lamp shades. The black laquer cocktail table is another Antique of which the high gloss laquer top adds drama to the space. 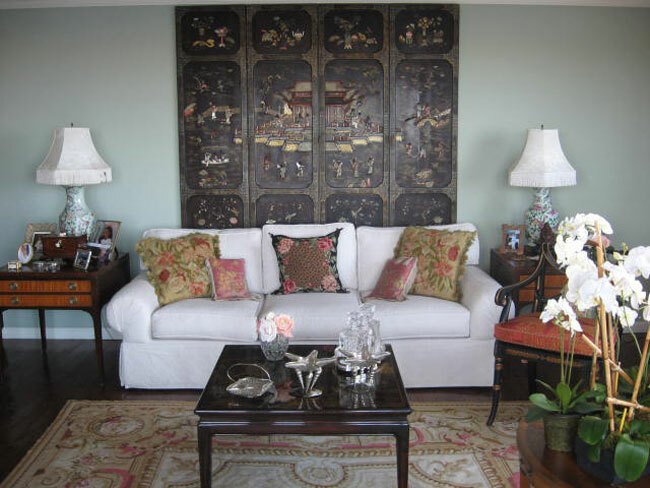 The top is from Japan circa 1835 where it probably originated as a decorative wall panel or part of a paneled screen. Using new legs this Antique panel makes for a dramatic cocktail table. The petit point wool carpet is an Aubusson from China, has a very tight precise pattern and the colors are spectacular. Throw pillows are beautiful needle points and the 2 small dark pink pillows are made from some Antique Japanese silk I found in my travels. Drapery design is mine and the fabric is pure silk taffeta. This room is one of my favorites. Even though Old World is so apparent in this space, the elements are eclecticized in a very uptown-urban sophisticated venue. The colors are so beautiful and are a wonderful change from the very trite and overused monochromatic beige on beige. Room Designs that ALWAYS endure !